Dr. Sandeep is joined by pediatrician Dr. Scott McMahon from Roswell, New Mexico, about the prevalence of Mold Illness/Chronic Inflammatory Response Syndrome (CIRS) in children and how to adequately screen, diagnose and treat kids using the Shoemaker protocol. 1:29:25 – How long do you use VIP? Okay, everyone. Welcome to this webinar on managing mold illness in children. I’m super excited to be sharing the room today with Dr. Scott McMahon from Roswell, New Mexico. How are you Dr. McMahon? I’m doing great, Sandeep. How are you today? I am fantastic. Super excited on talking about this subject of mold illness in children because I think it’s really an under-recognized topic and one that hasn’t been covered in a lot of depth so far. So I really hope that we can introduce a bunch of different facts that will be helpful for people. You being a pediatrician, I think you’re the perfect person to have to discuss this subject and to illuminate what’s different about treating mold illness in children and what things we need to be aware of. So thanks so much for coming along today. So before we start, I just want to suggest to people that to get the most out of this webinar, if possible, if you may care to please close or minimize other browser tabs and have a pen and paper ready because there may be just a couple of little things that are mentioned during this call that may be new or maybe worth jotting down for you. We would really appreciate your full attention. I think this call will definitely have some new information that you will not find elsewhere. 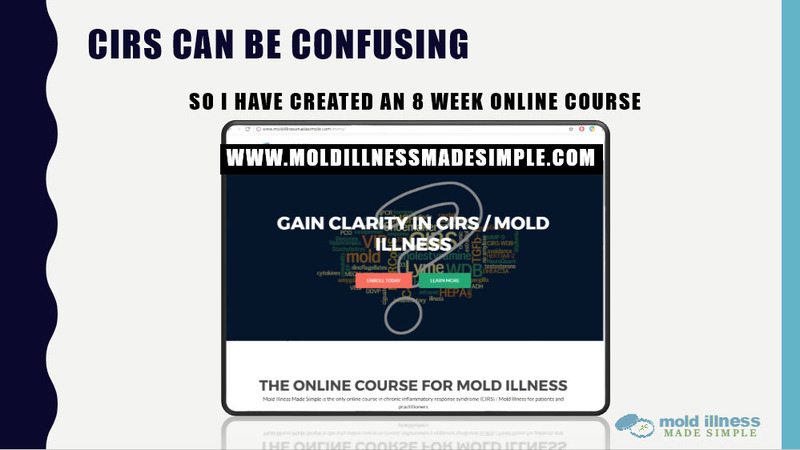 I’m going to talk about this later on, but we’re really passionate about this course called Mold Illness Made Simple that I’ve developed to help people to understand CIRS or mold illness really easily. If you can’t hang around for the whole call, we are going to be offering a coupon, which is called KIDSBEATCIRS [Enroll]. So if you need to go, that is going to give you 25% off the course rather and that’s available for the next 48 hours. Okay, a little bit about me. Most of you already know me. So I’m going to jump through this really quickly. 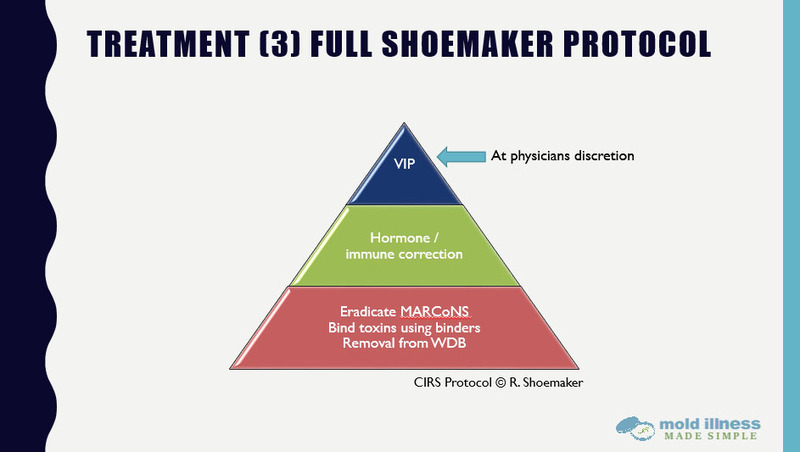 As you know, I am the creator of the Mold Illness Made Simple course and I’m also the first non-US doctor to become certified in the Shoemaker Protocol for Chronic Inflammatory Response Syndrome (CIRS). I created a document called Surviving Mould Down Under, which I’ve hoped has made it a lot easier to understand this illness and how to navigate it for people in Australia. I was lucky enough to co-author the Physicians Consensus Statement on CIRS with Dr. Ackerley, Dr. Berndtson, Dr. Rapaport, Dr. McMahon and Dr. Shoemaker. So that’s a little bit about me and there’s much more about me if you have a look at the MoldIllnessMadeSimple.com website, which outlines our course. Would you like to introduce yourself, Dr. McMahon? Certainly. My name is Scott McMahon. I graduated from Creighton University School of Medicine in 1989. I did a very prestigious residency at Duke University Medical Center, finished in 1992. I’ve been in Roswell the last 25 years seeing children. For the last seven, eight years, I’ve been involved seeing children and adults with Chronic Inflammatory Response Syndrome. Great. Would you like to talk a little bit about the papers that you’ve co-written or written as the sole author? Sure. Most recently in 2017, I published two papers. One of them looks at the way we make the diagnosis of Chronic Inflammatory Response Syndrome. I’d like to think that I simplified it. I took what was already in the literature from the United States government publication and what Dr. Shoemaker had done and distilled it down to a certain number of symptom clusters and a certain number of abnormal labs out of the standard ones that we do. If a child or an adult meets those criteria, the diagnostic error is extremely low. For instance, our error in children is around one in a million and our error in adults is about one in 5,000. If you know anything about medicine, those are really pretty amazing numbers. So that was one thing. From that, we developed some prevalence data of how often that we were seeing Chronic Inflammatory Response Syndrome in my own pediatric practice. The important thing about that number is it’s a very minimum. These are the ones that we have actually seen in the office and saw that they had symptoms and then we worked them up and saw that they truly had Chronic Inflammatory Response Syndrome. So that was pretty amazing. The other study that I did was looking at visual contrast sensitivity in children. There are norms that we look at for adults, but there were no norms for children. So we looked at almost 160 children, who just showed up for well checks in our office. In our screening, we tried to remove anyone who had multiple system illness and later work them up to see if they had CIRS. In those who didn’t appear to have CIRS, we actually did their visual contrast sensitivity. What we found was that the norms for children are the same as what we use as norms for adults. Not only that, we didn’t any difference between boys and girls. We didn’t see any difference between kids who had asthma or didn’t have asthma, or for that matter, any other chronic illnesses. We got prevalence data from that too, which is different than the prevalence data we got from the first one. Prevalence, it’s an idea of how many people in a population actually have this illness. So in the first study, we were looking at people that we had already diagnosed with CIRS. In this one, we’re looking at healthy kids. What we came up with was an amazing number of the 160 that we looked at, at least 12 of them already had CIRS and the other eight are in the process of being worked up. So what it showed was that at a minimum, 7.6, or one out of every 14 children has this illness. At the maximum from what we have, somewhere around 12.5%, 12.7%. That can mean one out of every eight children. That means in every class room, there could be four children who have Chronic Inflammatory Response Syndrome. That means in everyday that a pediatrician is seeing a full load of patients, he’s seeing three or four kids that have CIRS and may not even know about it. That’s quite mind-boggling, isn’t it? I guess if the average physician knew about that or if the average pediatrician knew about that, that would really make a huge difference in that practice, wouldn’t it? Well, it would, Sandeep. Actually, it’s staggering how high that number is. We in pediatrics know that asthma is by far and a way the most common chronic illness in children, by far and a way. It’s not even close with anything else. This is more than asthma. This is higher than the prevalence of asthma is in pediatric children. I guess all children are pediatric. I mean, that’s absolutely mind-blowing. The saddest part about it is that most doctors aren’t aware of this illness yet and so they’re missing it. So you’re saying this could quite possibly be the most common illness in children and the huge problem is that that most physicians aren’t even aware of it. I mean, that’s actually beyond belief, isn’t it? Well, it is and you’re wondering, “Where are all these children? How come nobody’s picked it up?” Well, again, if you know about pediatrics, you know that one of the most common problems that we have is chronic abdominal pains. We have a workup that we do and we send people to gastroenterologists and they do their workup. For the most part, these kids come out with a diagnosis that’s basically functional because nobody knows what’s really wrong with them. When I take those functional children, and this is something that I’m hoping to publish later this year, when I take those functional children and I work them up for CIRS, nine out of 10 have CIRS. This is one of the biggest problems in pediatrics and nobody knows what causes it. I can say that almost the identical thing about chronic headaches and it doesn’t matter what kind of headaches. Whether you’re looking at chronic daily headaches or cluster headaches, migraines or tension headaches, nine out of 10 people that I evaluate for CIRS that have chronic headaches end up having CIRS and when we treat them, they get better. So when this data come out and people accept them and replicate the studies that I’ve done, when that data come out, it will change pediatrics remarkably. Interestingly enough, we see the same kind of results in adults too. Just how prevalent it is and also how advanced the science on CIRS already is, I think is also quite staggering. So yeah, wow! This is really exciting stuff. I’m really going to be excited to see what else comes out of this webinar and out of this information on CIRS in children. Let me just say. Okay. For some reason, this is not working in slideshow mode. So what I’m going to do is just put this on as large as I can and just run it on non-slideshow mode. I think that’s probably the best bet. Is that now showing up on the what is mold illness diagram? Okay. Great. Most of you who have looked at SurvivingMold.com and the information that’s out there on CIRS have noticed that it’s quite complicated to understand what exactly CIRS is and how it develops. I’ve got a slightly simpler diagram to explain this. If you start on the left-hand side of this diagram, you’ll see that biotoxins are small compounds that can be brought into the system or into the body through a water-damaged building or otherwise known as a moldy building or a tick bite, most commonly. There is also other causes such as infected bodies of water and spider bites and so on, but they’re pretty rare. So if you mainly think about them through water-damaged building or tick bites and realize that these are compounds that move from cell to cell and disrupt the functions of cells. So they don’t live in the blood. They’re mainly in the cells and that’s one reason we don’t actually have a blood test looking directly for mold toxins in the blood. It’s because they’re not actually there. So if you get exposed to one of these biotoxins such as through a water-damaged building or a tick bite and you’re genetically susceptible, now this is another really key point, that not everyone is susceptible to developing CIRS or mold illness. Only around 24% or 25% of the population have what we call a HLA susceptible gene type. If you have this genetic susceptibility, then instead of mounting a proper antibody response, what happens is we tend to develop a chaotic and ineffective inflammatory response that creates dysfunction of many bodily organs. Otherwise, those kind of symptoms may be thought to be emotional, but it’s important to know that in this case, it may be because there’s a silent fire going on in their body of inflammation and that they’re much more sensitive to mold and chemicals than other people would be. So as a result of this whole fire of inflammation that’s going on in the body, we get high levels of certain inflammatory compounds, which you can see over here on the top right of this diagram. Now, this is a little bit of an alphabet soup, but the main ones that you need to know are called C4a, TGF-beta and MMP-9. So these are inflammatory compounds that are fueling the fire of inflammation in the body. They’re like bits of wood which are fueling that fire to be even more strong in the body. On the other hand if we track back here to the last box, we also get low levels of hormones that regulate the inflammatory response. So not only are we getting compounds that are fueling this fire of inflammation in the body, we’re also getting low levels of hormones that normally would dampen this fire. They include MSH and VIP and ACTH. There’s a few acronyms and there’s no way you’re going to get around learning if you want to learn about CIRS. In this diagram, there’s about six of them. If you take a note of all six of those and just try to break them up. So going back to those three in the top right, they’re what we call inflammatory cytokines or inflammatory compounds and that’s C4a, TGF-b1 and MMP-9 and then MSH, VIP and ACTH are regulatory hormones. They’re hormones that regulate the inflammatory response. So they go low in patients with mold illness or CIRS. As a result of these hormones going low, particularly MSH going low, we tend to get a special bug in many patients with CIRS that gets into the deep nasal passages and that’s called MARCoNS, which is spelled M-A-R-C-o-N-S. The problem is when you’ve got this bug, the MARCoNS, that tends to further lower MSH hormone. Therefore, that blocks you from getting better from this illness. So it’s important to know whether you’ve got MARCoNS so that you can eradicate that and then your regulatory hormones such as MSH have a chance of coming up. So I hope this gives a bit of understanding around the mechanism of CIRS or mold illness. Dr. McMahon, anything you would like to add to that or do you feel that that explains it well? That was an excellent explanation of a very complicated illness, but if I might make just a couple of points. 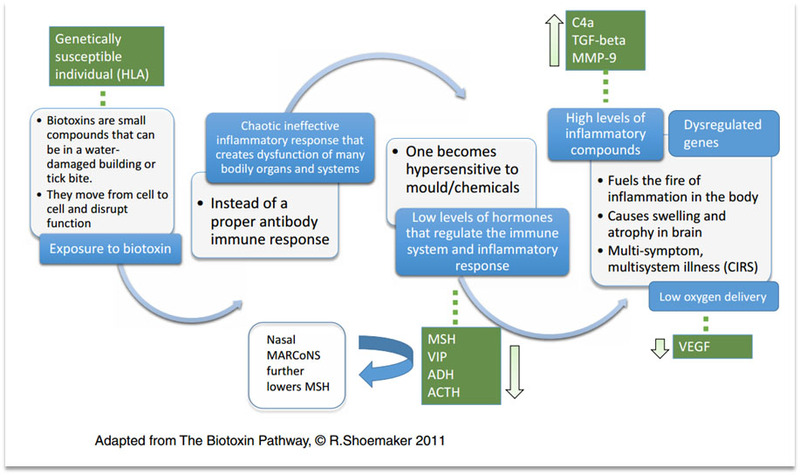 Down at the bottom where you have “Eg MSH” and you’re talking about the chemicals that are involved in the inflammatory response, I would actually add in ADH, Antidiuretic Hormone, which not only is it involved in regulating how often a person voids or pees (urinates) but also is involved in the immune response. The other thing that I would say is where you were talking about chaotic ineffective inflammatory response up at the top toward the center. As a person gets exposed over and over again, whether that’s Lyme that’s still inside them or they’re living or working in a water-damaged building, as they continue to inhale more toxins or bacterial endotoxins or inflammagens like beta-glucans and mannans and what not. Those things are actually triggering their own immune response and because the immune response is not handling those properly, that immune response actually gets bigger and bigger and bigger and bigger as time goes on. I think that’s part of what we see with “sicker quicker” is just repeated exposures. You’ll see patients, particularly in adults, but also in children, who when they get re-exposed, they can relapse and actually get worse. That’s because their immune system has already learned how to make a response and with the new exposure and even bigger response. So when it comes to treatment, it always comes back to toxin avoidance is the most important step. Great. Yeah. So that’s a really important point that if you don’t get away from the toxins that are causing this, you can’t really recover from this illness easily. I guess that’s a really important take home point. So thank you for that additions. Sometimes in children, they will recover anyway, but then they relapse. In adults, it’s really hard to get better if you don’t get it out of your toxic exposures. Okay. For some reason, I’m not technical enough to work this out. I’ll just work in this mode. So going into screening, what do we mean by screening firstly? If you’ve got a child who has exposed to a biotoxin in some way such as a water-damaged building, you may be wondering whether they could have CIRS. Maybe they have some symptoms. Maybe they occasionally get some abdominal pain or some headaches. You may be wanting to work out whether they should be further evaluated for this illness or CIRS. Now, one of the simple ways of doing so is through using what we call the symptom cluster table. This is something we use in adults as well. Generally speaking in adults, we tend to use the cutoff of eight or more clusters, tends to be of highly indicative of CIRS. While if you have four or less, that tends to be very indicative that the person doesn’t have CIRS. Dr. McMahon, I understand in kids, it’s a little different and that generally, young children, particularly tend to have less symptoms and less bodily involvement. 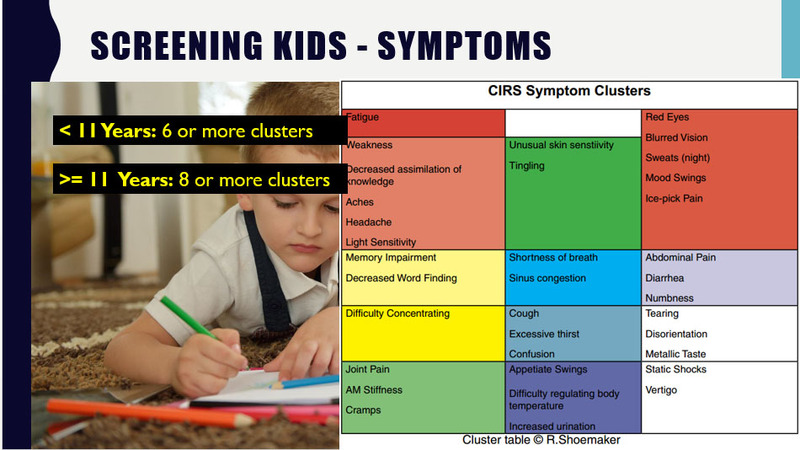 So we tend to use six or more clusters as being an indicator that they may have CIRS. Is that correct? That’s correct. I use clusters for diagnosis and for screening. I also in children who are say under six years of age, if I saw that they had chronic headaches or chronic stomach problems or they were tired compared to other children their age, I would go ahead and work them up for CIRS just on that basis if they had even any one of those. For children under 11, I would look at those. I also look at frequent muscle aches that are often called growing pains and look at the inability to get potty-trained by six years of age and inattention when they go to school. As far as clusters are concerned in the research that I did, I found that having a positive amount of clusters, so for kids who are 11 years or older, including adults, if you had eight or more clusters, that was highly sensitive for picking up CIRS. As you said, if they didn’t have at least eight clusters, they probably didn’t have CIRS. For kids who are under 11 years of age, they almost always have six clusters or more. Okay. That’s really, really important. Presumably sometimes, one of the issues in children is that they may not be able to describe their symptoms accurately. So some of these symptoms are a little bit like unusual skin sensitivity. It may be that for a young child, for instance, they may not be able to put that in words. So I presume sometimes there’s a little bit of guesswork involved in this kind of cluster evaluation when it comes to kids. Would you say that that’s correct or there’s some educated guessing that would need to go on? That’s correct. You bring up a really excellent point there, Sandeep. It’s really important I think for a practitioner to sit down with a patient or with a family if it’s a young patient and ask these questions and keep asking the question until you’re pretty sure it’s a yes or a no. Some people just give out checklists in medicine and I don’t think that’s nearly as accurate because the parents don’t always know what you’re really asking. If you say, “Does your child have unusual skin sensitivity?” Sometimes if you ask that question and say, “Do you have problems with constricting clothing or does light touch really offend your child?” you can get a yes where there might have been otherwise a no. So it’s really important to do that. The other point I would mention, I don’t know how familiar your watchers are with the clusters, but if you have even one symptom from a cluster, then it counts as a positive cluster. Yeah, that’s an important point. Thank you for mentioning up. For instance, just to put this layman’s language, so if you would ask your child, for instance, about difficulty concentrating, what kind of language you might use in let’s say a four or five-year-old in trying to ask them about do they have difficulty concentrating? Would you mind giving us an example? Great. That’s a really good example. So it’s important to know that the wording needs to be clear when we’re asking these things to parents or children so as to get an accurate response. What we’ll do is we’ll try and send a simple version of this cluster chart out to viewers who’ve subscribed up to the Mold Illness Made Simple mailing list just so they have a simple screening sheet that they can use to check with their kids if they’re concerned that they may be suffering from CIRS. Just expanding on that, in children under 11 years old, they often may have single complaints. So this is a little bit of an exception to the rule that CIRS is what we call a multi-symptom, multisystem illness and this is something that I talk about quite a lot in the Mold Illness Made Simple course, is that in adults, it’s something that’s going to be affecting a whole bunch of bodily symptoms, not just one. However, Dr. McMahon, when we were talking recently, you said that it often does start in children with just one bodily system. So maybe could you talk a little bit more around how children under 11 years may present and how that’s different to adults? Sure. When the babies are born, you assume that they’re not having any system problem because they certainly can’t complain about it. By the time they become teenagers, usually we see the classic multisystem, multi-symptom illness that is Chronic Inflammatory Response Syndrome. So if you start at zero and somewhere along the way you have six, seven, eight systems involved, at some point, you had to go through one or you only had one system. 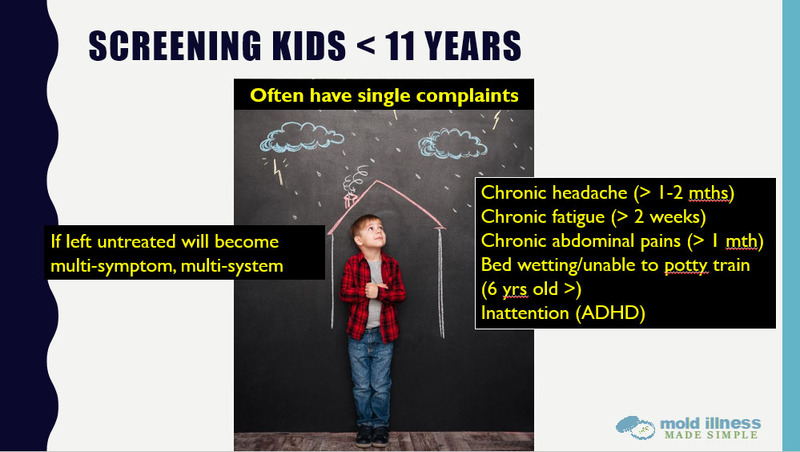 I’d like to think in my pediatric work that that’s what we’ve been able to develop is to actually see, early on, when children are having symptoms that they’re having problems long before they get to multisystem illness. Again, in children under five, I look for chronic headaches, chronic fatigue and abdominal pains. The truth be told in my pediatric practice, I don’t ask parents, “Do your children have chronic headaches, chronic fatigue or chronic abdominal pains?” but when they come and they complain about them. I say, “Well, how long have you been having these belly pains?” “Well, six months.” I’m like, “Wow! That’s a long time.” So I’ll do the normal pediatric workup, what most pediatricians would do to rule out things like ulcers and constipation and urinary tract infections and that like, rheumatologic illness. Almost always, that workup comes out normal. So then I do the CIRS workup. That almost always, nine times out of 10, comes out abnormal. Then I sit down with them and meet with them in the CIRS clinic and we talk about that. We start treatment and nine times out of 10, we see their abdominal pains go away or get much, much better. It’s really wonderful because I get to see these children and nobody really knows what’s wrong with them and make them better. It’s awesome. So in children who are under six, we look for headaches, fatigue or belly pains. Any one of them would make me start thinking about CIRS. If they had two or all three, almost every time, it’s CIRS. In children under 11 like I said, I would add a few other things in there, the inability to potty train by six years of age, which usually is an antidiuretic hormone deficiency. We see antidiuretic hormone deficiency in over 80% of our kids. Then the other would be inattention in school, where they’re being labelled as ADHD or the school or the teacher is starting to question whether there could be some ADHD. Sometimes it is and sometimes it’s just plain CIRS. So if you treat the CIRS, you see the inattention go away. Then the final one I mentioned before is myalgias, muscle pains. They go on and on and on. It’s okay to have growing pains when you’re going through a growth spurt, but that should last only a month or two. It shouldn’t be going on two to three months, six months, something like that. If I see prolonged growing pains, then we start the evaluation also. By the way, those kids are going to go on to probably have fibromyalgia. If you can treat it early, you can treat them and educate the family so that they can prevent symptoms down the road and they never have to have multi-symptom, multisystem illness because we caught it when they were a youngster. Yeah. Now, that’s a really important one right there, Dr. McMahon. Then if we can prevent these kind of severe illnesses that I see a lot of, for instance, in my clinic like chronic fatigue syndrome and fibromyalgia, which in many cases can just be manifestations of CIRS, then we can actually ensure kids have healthier lives. That’s actually a real motivation for putting in the effort I guess to find whether they could be suffering from this illness, isn’t it? Absolutely. At some point in time I think when we have enough information, we probably should be screening children when they’re very young, maybe even doing HLA. I know that that makes some people uncomfortable about screening for genetic illnesses, but on the other hand, right now in my pediatric practice, we screen all newborns for 32 genetic illnesses, every single one of them. The reason we screen them is because if you find it early, you can effect therapy and you can prevent permanent symptoms. I would argue that we have enough data at this point. We just haven’t had any people replicate the data sufficiently and publish it to show that if you treat this early on, you prevent problems down the road. So that’s another really important point there. Thank you. The other thing we talked about was that in children who are suffering from autistic spectrum disorders as well, that’s another area in which it’s extremely important to screen them for CIRS. Would you agree, Dr. McMahon? Absolutely. There is a tremendous amount of overlap between the symptoms that you see in CIRS and that symptoms that you’ll see in full-blown autism, on the far end of the autism spectrum. Many, many people believe that autism and the entire spectrum is a toxin-based illness. So it makes sense that at least some of these children that their toxin was from a water-damaged building, or possibly from Lyme. Focusing some research funds on screening these children at a younger age before they’re developing the symptoms that everybody can detect is autism by 12, 15 months of age. If we were looking for it at a younger age and demonstrate they have CIRS, we might be able to prevent a large number of autistic cases. Yeah, that’s right. That’s becoming such a significant illness these days, isn’t it? The prevalence of autism is really increasing. It’s a very disabling illness obviously and very greatly affects the course of someone’s life. So if we can find a way of helping people with this illness, particularly if there’s an environmental cause such as water-damaged buildings that could be contributing, then that’s really important that we do that as physicians and as parents. Absolutely. You’re right. The prevalence of autism is skyrocketing. Five years ago, it was one in 88 kids. The most recent thing I read was one in 66. Remember, CIRS is at a minimum one in 14 and maybe one in eight and possibly even higher than that. Right. Yeah. So that’s another very important area. Okay. Moving on. So I believe this is the new device you’ve patented, Dr. McMahon, is that right, for VCS in children? Yes. We have a version that goes over the entire head. We’re just joking around here, folks. This is just a stock photo. 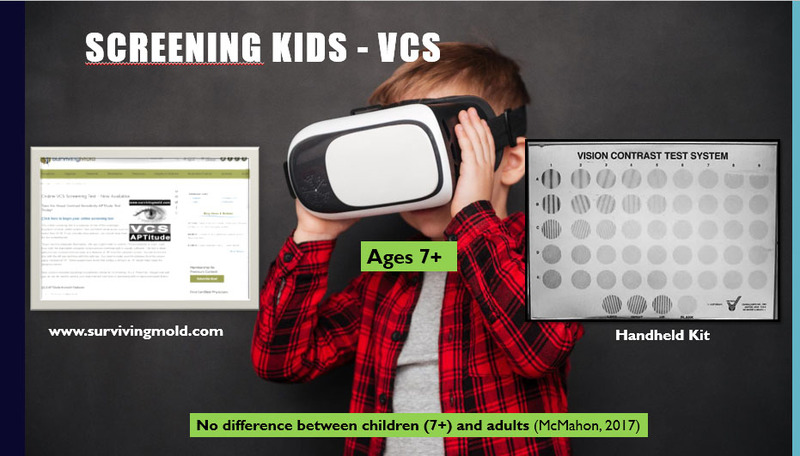 Generally with VCS testing or visual contrast testing in children, we still use either the online screening test, which is on the left-hand side of the slide, which is at SurvivingMold.com, which usually costs about $20 if you just sign up and create an account or there is a handheld kit, which looks a little bit similar to the one on the right-hand side here, which some physicians have in their office such as myself and Dr. McMahon, where you actually have a certain device that sits under the chin of children and we get them to point out whether the lines are going up or going left or going right. You found in your study that the VCS test was just as effective in children aged seven or above as it is in adults. Is that correct? That’s correct. VCS, Visual Contrast Sensitivity is an important test in the treatment and diagnosis of CIRS. So it’s important to know what the normal ranges should be for children. I think it was very valuable to demonstrate that the same level of abnormality shows up in kids as it does in adults. Okay. Great. So we’re still talking about a score above five in the D row or the D column and a score above six in the C row or the C column, depending on which test you’re using is needed to pass this test. So that’s the same criteria. Okay. Great. Now, talking a little bit more on moving from screening to diagnosing. So let’s say your child has been exposed to a water-damaged building or a tick bite or some other form of biotoxin exposure and they have either a positive cluster analysis or a VCS. Would you say one of the two would be sufficient to then want to pursue further diagnostic tests, Dr. McMahon, in a child or would you want both of those tests to always be positive? I think either one is sufficient to move forward. Yeah. So if your child had a positive cluster analysis or a positive Visual Contrast Sensitivity test, you may want to get them to see a certified Shoemaker physician and they would be able to run these kinds of tests. Again, it’s a little bit of an alphabet soup, but the tests are basically the same that we run in children as we run in adults. Sometimes I understand you might do a slightly smaller panel of biomarkers in children, Dr. McMahon? That’s correct. The children, depending on their size, on their weight, they have less blood. So for instance, if I was going to draw this entire panel that you have listed here, all of these biomarkers, I would probably, in a five-year-old, I would do it in two separate blood draws, separated by maybe a week of time so that I don’t take too much blood out of them. Also, Dr. Shoemaker has a list of roughly 38 different tests that he does, which include these biomarkers. I don’t do all of those in children for that exact same reason. Also, some of the tests that he’s running in that larger profile looking to rule out diseases that don’t routinely happen in children like type 2 diabetes or lupus or other rheumatologic disorders. So I’m looking specifically to show that they do have this illness. Okay. Great. So then in children, it can be sometimes a more concentrated blood panel. In Australia, we don’t have all of these tests easily available, but the ones on the left-hand side with the exception of MSH are available here easily through the local laboratories, such as HLA gene testing, which often gets called Celiac Gene Studies and then VIP, MARCoNS testing, which can be done recent to Microbiology Dx or sent via NutriPATH and then ACTH and cortisol and ADH and osmolarity. 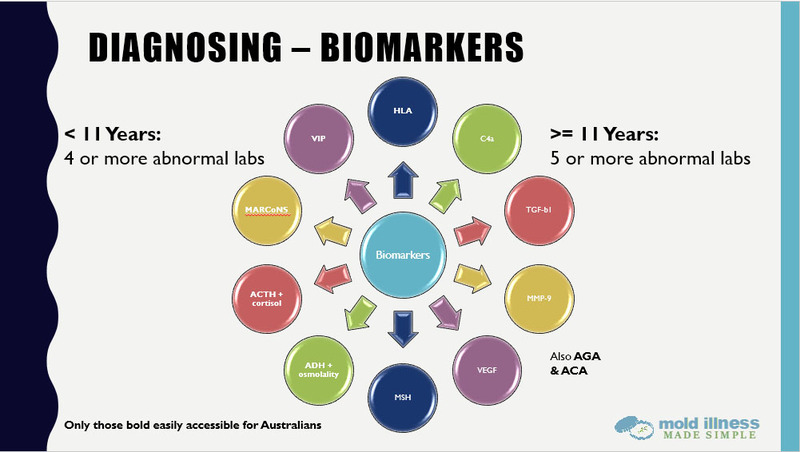 So in Australia, the other tests including C4a and TGF-b1 and VEGF and MSH particularly are available through Quest and we do have an arrangement through some of the certified docs in the Sunshine Coast of Queensland, in Sydney, New South Wales and Melbourne, Victoria to have people have blood collected for Quest. At this stage, that is the testing that is basically the gold standard that corresponds with the studies on CIRS that are being done by Dr. Shoemaker. At this stage, we can’t recommend the local testing with NutriPATH because it’s not corresponding well enough to give us a strong confidence in that testing. Great. So jumping on to treatment now, so let’s say a child has tested up positive for some of these biomarkers which shows that they do have this silent fire of inflammation going on in their body. There’s some good news here. The good news is that younger children often get better quicker or faster than adults do. As we say, if you pick it up early, the outcome is often very good. Could you expand on this, Dr. McMahon? Certainly. When I see adults who have had symptoms for 15 or 20 years and they have a multisystem illness and often their labs are just outrageous and they’re really struggling in many areas of life. When I see children, particularly five, six, eight years old, seeing them with one system is involved instead of having to do cholestyramine, the powder, for two or three months, I can treat them sometimes in two weeks and they’ll be completely back to normal. They have 100% resolution of their symptoms. Whereas what we see in adults is more likely they have about 70% resolution of their symptoms, somewhere between 70% and 90%. So not only do they get better faster, but they have a more complete recovery. Then because you know about the problem and by using the HLA, you can identify what toxins are going to offend them and make them relapse, then you can prevent after that. So it’s just so much better to find them at a young age. Absolutely. So that’s really huge motivation for parents who have children who could be suffering from CIRS to just look at this problem as early as possible and not leave it for too long because that’s really good news that if they can be treated and identified early, they could just have a very quick course to recovery and hopefully to not develop further problems in the future. So moving right ahead. As Dr. McMahon mentioned, the most important step of the CIRS treatment program in kids or in adults is removal from exposure. So in the case of water-damaged buildings, it means getting into a building, which means home and school building, that is safe from a water-damaged perspective. Really in general, that’s going to mean a house with an ERMI that’s less than 2 or a HERTSMI-2 score that’s less than 11. Is that one of the two that you prefer to use, Dr. McMahon, in children or in patients in general? I use both. I think they actually give you different information. Of course, from an ERMI you can calculate a HERTSMI-2, but I use both. Okay. Great. So if you’ve got a child who’s in a building that has a high ERMI score, is there a particular process or a particular series of steps which you suggest that parents follow in order to workout what they’re going to need to do to remediate or relocate and get into a safe building? Yeah. When we see new patients, we always go through what their environments are like. I’ll ask them what school they’re going to, I have a pretty good insight into what schools have problems, what portions, what schools. For instance, one of the high schools in my city just has problems in the freshmen wing and most patients and teachers do quite well in the rest of the high school but in that one wing I have a lot of patients every year, and a lot of the teachers. In one of our other high schools that has a basement, I just get a lot of patients every year because no matter how much they remediate, there’s only so much that they can do. When I find that patients have problems in their homes, what I usually recommend is that they hire a contracted licensed mold inspection agency to come in, take a look, find where the problems are. They’ll create a remediation plan. I actually work with one here in my hometown that is called MIRC, Mold Inspection Remediation Construction. I work closely with them and a lot of their patients. I review their tests and I review their reports with the patients. The idea is to find out where the problem is, and then get a licensed contractor that has mold remediation expertise in to take care of it. That last step, I can’t emphasize too much because if Joe Johnny on the spot comes in and does remediation in your home, they may do a tremendous job with the carpentry but if they don’t know about mold and how it harms people, how it might harm themselves, they could actually make the problem worse by spreading it throughout the house. Taking an area behind a cavity, for instance and opening it up. So where you’re getting a small amount of mold being pulled through by airflow in the home, now you have a huge amount of flow going through. Then of course, you also have to look at the HVAC – the heating and ventilation, the air conditioning. If you don’t look at that system, because it frequently is part of the problem, if not all the problem, then you’ll miss mold. Okay. So there is a number of subtleties to this it sounds like, Dr. McMahon and that’s something we cover in the Mold Illness Made Simple course as well. One really important thing to know is not just any indoor environmental professional is going to suffice in terms of giving you advice as to what needs to be done to your building. You really need to get an IEP, which is short for Indoor Environmental Professional, that is familiar with CIRS and familiar with the level of cleanliness that a home or a school needs to achieve in a patient with CIRS, if you’re going to get proper advice. Therefore, it’s really important to ask them a bunch of different screening questions to make sure that they understand this illness and understand how to work with ERMI testing rather than just air testing so that you get the proper advice. So this is a very important step and it’s a step that can be quite easily mucked up as Dr. McMahon mentioned. So one reason to take a look at this course is just to get some of those questions to make sure that you get an IEP who’s really at a level that’s going to help you through this step of the protocol. So I think that’s a very important point. That’s a really important point that you make there, Sandeep. If you don’t mind my just mentioning it. Different Indoor Environmental Professionals, IEPs, are going to test your house in different ways. The people that don’t really know what they’re doing will usually just come in and they’ll take one air sample from a machine that’s a pump. It’s about this big and they’ll take a five-minute sample that will take 75 liters of air and then they’ll do it inside your house one time or maybe once in several rooms. Then they’ll do one outside and they’ll compare those. There are incredible number of subtleties in how you interpret that. If you don’t interpret it correctly, you’re likely to tell somebody that the home is fine. The problem is that that way of doing testing is the least likely to find mold. It’s the least likely method and that’s what most people do because it’s easy and because it’s cheap. It also gives people a false sense of protection because it’s not sensitive enough just doing one sample inside and one sample outside. It’s not sensitive enough to say that the house is clean. You have to do other forms of testing, whether that’s bulk or tape or ERMI or HERTSMI or what most IEPs recommend is a combination of both. If you don’t have somebody who’s really CIRS competent, then you’re likely to get information that’s garbage. One last thing I’ll say about that is on the Surviving Mold website, there is a consensus statement that was put together by yourself and myself and a number of other CIRS doctors and some IEPs that have an average about 30 years experience and who are CIRS aware and there are actual guidelines there that you can read. It’s about a 35-paged document, but if you read that and you understand it, you will be well-equipped to have your house evaluated. Right. So thank you for that extra addition. So folks, I really want you to take notice of this. This is the most important step of the CIRS treatment protocol and it’s very important to get this step right and not to muck this step up. If you get it right, your children are going to get well. That’s extremely important too to take note of. Moving right along here. 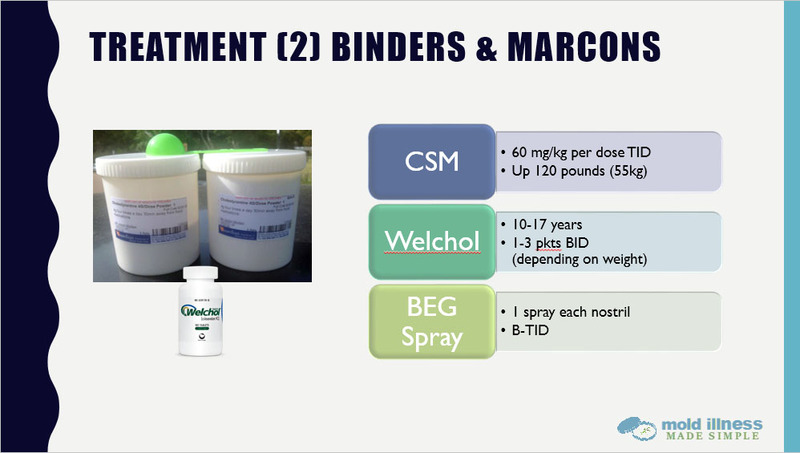 The second step of the CIRS treatment protocol, which is also very important and we’re combining two steps here actually is binders and also treating MARCoNS. Now, generally speaking, MARCoNS or nasal staph is something we look for in slightly older children. Would you say more children above the age of seven, Dr. McMahon? I’m more likely to test MARCoNS in teenagers. In teenagers, right. Okay. So if your child is younger than the teen years, it’s less likely that they will have MARCoNS. Therefore in most cases, it probably isn’t necessary to pursue that step of the treatment program. Is that right? I do test MARCoNS in children if they’re not improving the way I expect them to. I’ve seen enough children and I’ve seen enough adults now and I’ve followed them closely enough that I really have a good sense of how quickly you should be getting better. If you’re not following that, then I will follow up with MARCoNS. Okay. Great. So tracking back to binders, what binders are is they’re a certain type of medication or sometimes they can be natural substances as well that actually bind onto biotoxins in the small intestine. These biotoxins come into the small intestines through the bile. The problem is if you don’t use binders, the body tends to recirculate these biotoxins. So if you introduce binders into the system, we can latch on to these biotoxins and take them out of the system into the stool and those biotoxins no longer can be triggering the inflammatory cycle in your body or the silent fire of inflammation. So the most common binder and the most effective binder is cholestyramine. You can see the spelling of that on this left-hand side diagram where you can see some tubs of medication there. It’s called CSM for short. The dosage in children is different for adults. The dosage is 60 mg/kg/dose three times a day. So TID is medical Latin for three times a day. We use that same formulation up to 120 lbs children or 55 kg children. After that weight, we start to use an adult dose of 4 grams four times a day. Is that correct, Dr. McMahon? Okay. Great. I believe you’ve mentioned that in the vast majority of children particularly small children, cholestyramine works beautifully. Could you please tell us quickly about some ways in which you can actually get children to tolerate cholestyramine? Well, cholestyramine is a powder. It tends to have an orange color. Different manufacturers are a little more orange or a little more yellow. It’s gritty. It’s like sand. Actually, I call it orange sand. It doesn’t matter to me what method you use to get it into your child. If they can take it in water like two or three, three or four ounces of water, that’s fine, but it doesn’t have to be. It can be in juice, orange juice, orange juice with pulp. It can be mixed with food. I know in general, we don’t do cholestyramine with food, but with children, you do what you have to do. You can put it in apple sauce. My favourite way and I’m not very good at taking medicines and I took some cholestyramine for about a month just to see what would happen to me. I tried to take a dose straight. It didn’t go well. I took a banana and an apple and some grapes and I put them in a blender with just a little bit of liquid. It could be juice or water. I buzzed the blender up and I poured two or three ounces of the cholestyramine in a glass. I poured my dose, which was a full scoop, three teaspoons work into that and mixed it up. I put just a little bit of grape juice, one or two teaspoons to make it drinkable. I just drink it right down. Another important point about cholestyramine is that once you take the dose, I want you to get everything out of your mouth. I don’t want it staying, sticking to the teeth because it can affect the enamel over time. So it’s important after you take your dose to follow it with juice or water or something to get it off the teeth or even brush the teeth if you have to. Rinse and spit, whatever is necessary, but get the extra out of the mouth. Great. So they’re really important points about cholestyramine. An important thing is that you can mix it with some food to get your kids to take this medication. That’s perfectly fine. Really, it probably should be done that way because you don’t want your children to develop an aversion for cholestyramine. You want them to want to take it. Therefore, mixing it with apple sauce or Dr. McMahon’s other super recipe he mentioned there is a really good idea. I’ll very quickly mention Welchol. Welchol is the main alternative to cholestyramine and it’s mainly used in children 10 to 17 years of age. We usually use one to three, that should be one to three tablets. Yes, tablets twice a day depending on their weight. Your physician can tell you exactly. So the adult dose is two tablets three times a day. So I would say in many cases, it could be one tablet twice a day, just depending on the weight. If your child can’t swallow tablets, it can be crushed. That one can also be added to food. Is that correct, Dr. McMahon, if needed? Okay. Great. So one way or another, you should be able to get binders into your child and that’s an extremely important step for them to get well from CIRS. So these are the two most important steps actually is just being removed from exposure and taking binders. Now if they’re an older child and they have tested positive for MARCoNS, there is something called BEG nasal spray, which is usually sourced from a compounding pharmacy such as Hopkinton Drug in the United States or in Australia, Your Solution Compounding Pharmacy or another compounding pharmacy. Often, the dosage is one spray each nostril two or three times a day rather than two sprays three times a day that we use in adults. Can I make one other point about that, Sandeep? If you can do those first two steps of therapy, which is get out of your toxic environment or remediate it properly and take either cholestyramine or Welchol for the diagnosed period of time, in children under 19 years of age, we have 70% improvement in well over 90% of our kids, just from those two steps. All right. That’s pretty astounding. So in the majority of cases, that actually makes it a lot less overwhelming for people I think as well just to know that a lot of the time if you just do these two steps, your kids are going to get well. The other steps are just in cases where they’re not getting as well as we would expect. So that’s really good actually just to take that as a take home point. There’s really only two main steps for children and that’s removal from exposure and taking binders. So there’s a lot of hope for your kids here, folks. So moving on to this, we’re not going to spend a lot of time on this, but in some cases, VIP nasal spray, which I call the cherry on the top of the CIRS treatment protocol can be used in children, particularly children of an older age. Would you like to very quickly speak to that, Dr. McMahon, about what experiences you’ve had with using VIP nasal spray in older children? Well, we’ve used VIP now in seven children under an experimental protocol. The results in six of those seven have been nothing short of phenomenal. In one child, patient was maybe 14 years of age, had not been to school for over three years, almost four years because she had so sick for so long. I came in to start therapy at about that time. We started her on VIP at 1 to 10 dilution. Within a couple of months, she was back to school for the first time in almost four years. She’s now have been on VIP for two years and she rarely misses school. In another child, she had missed 27 days of school the year before. Missed almost none the following year on VIP. Another child, the school was sure that he had ADHD and he was being treated for ADHD with Ritalin or Ritalin-type medicines. He was having a lot of behavioral problems. We treated him first with the first few steps of CIRS and he got much better, but he was still having behavior problems. We started VIP and we saw his behavior problems went away within a couple of weeks. Later on for financial reasons, the VIP was stopped and the behavior problems started to come back. We treated him again and guess what? Behavior problems started getting better almost immediately. Got another child who was much smaller. I think he was about three years old, hyper all the time, really not very responsive with his parents, just bouncing off the walls all the time. Gave him VIP and his behavior changed immediately. He also was having these mood swings that would last for hours, just crying tantrum fits and when he started on VIP again at 1 to 10 dilution, within I think it was a week or two, those were completely gone unless he didn’t get a dose of his medicine. If he was late on his medicine, he would start having the tantrums again. So really impressive results with VIP in children so far. Not enough to really say, “This should be a part of it.” Need to do some publications, need to do some case studies, but really promising results early on. Okay. Great. So in those children that don’t get better from those two simple steps, it’s really, really exciting to know that we’ve got this other step of VIP nasal spray that could be extremely helpful in these children and in some other cases according to the physician’s discretion. They may use some of these intermediate steps such as Minirin nasal spray [desmopressin] and so on in certain cases I understand. So really, the take home point you folks is that the first two steps are going to get the majority of children better, but there are a number of other steps that can be used at a physician’s discretion. So it’s very important to get a certified Shoemaker physician if at all possible to help your children. 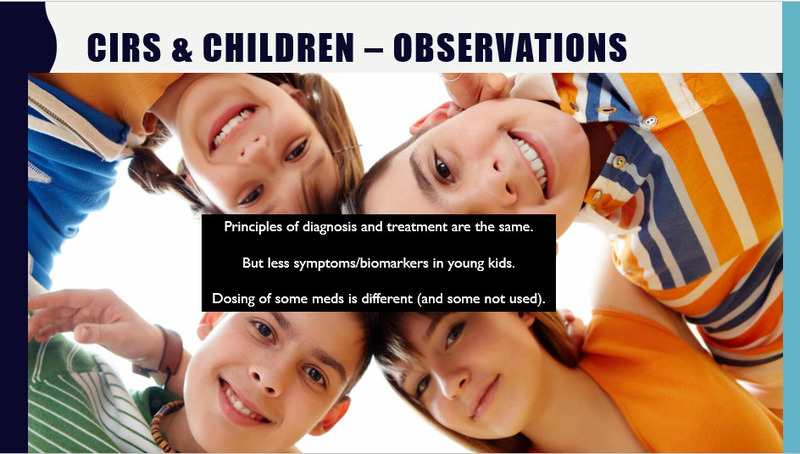 So some of the observations enclosing in treating CIRS in children are that the principles of diagnosis and treatment are basically the same with some slight variations, but there’s less symptoms and generally we test less biomarkers in young children. The dosage of some medications is slightly different and some are not used. So these are really some of the take home points from this webinar today. I hope this has been really helpful for people. Anything you would like to add about these final observations on treating CIRS in children, Dr. McMahon? I think you summed that up quite well, Sandeep. Do we have any questions that we need to answer? Yeah, we do. I think we should jump into those now..
…The first question, Dr. McMahon is what recommendations do you have for HLA-positive parents or CIRS-patient parents regarding being proactive in testing and monitoring their children for possible CIRS activity through lab work? Does that question make sense? That is. There are a couple of ways that I approach that and they differ based on what the parent’s HLA is. For instance, if the parent has two mold HLAs, a 7-2-53 and a 4-3-53, they have a mold and say are “dreaded”, well, I know that every child that that parent sires is going to have one of the HLA abnormalities. They’re going to get one from that parent and maybe one from the other parent too. That’s important because most of our younger children that we see are doubles. They have it from both sides of the family. You only have to have it from one side of the family to get this illness, but most of our younger children are doubles. If a parent had a double of their own, you know that the child is affected. So it’s important at some point to do the HLA, but you don’t have to do it when they’re real young because you know it’s already abnormal. One of the screens that I do in my pediatric office when I see somebody who I’m thinking might have CIRS but I’m not convinced and the parents are not convinced is I’ll do the HLA and I’ll do an ADH osmolarity and an ACTH cortisol, which are all tests that you can do in Australia if I understood you correctly. What that tells me is if two or three of those are abnormal, it’s going to be CIRS and then I know to do the whole workup. If I were a pediatrician in Australia, what I’d do is I would refer that person to Sandeep or to one of the other CIRS-certified physicians in Australia. Yeah, Dr. Janet Kim is the other one. So that’s what I would do. I would do the ADH/osmolarity and the ACTH cortisol. I have started doing VIP and MSH also. I think MSH, you said you had problems obtaining, but doing VIP also because if you have four abnormals and oftentimes you will have all four will be abnormal. You’ve already made the diagnosis based on your symptom clusters and the number of labs are abnormal. You have enough data to make the diagnosis right there. Okay. Great. So that gives us a bit of guidance on how you can follow your children if you’re concerned about the possibility of them developing CIRS. This next question is linked. If a child with a multi-susceptible HLA, so hopefully all of you know that there are different types of HLA genes and Dr. Shoemaker has referred to some of them as being multi-susceptible and that includes the 4-3-53 haplotype, which is one of the ones that’s been studied the most in-depth. For a child with a multi-susceptible HLA who’s experiencing symptoms of CIRS, how do you differentiate between Lyme disease and mold? What tests are used and at what point in the protocol that are Lyme related? Does that make sense? Yeah. I live in an area that’s not very Lyme-prevalent. There are 30 reported cases in the last 10 years and I think I reported the last three of them. I see people from all over the United States and even other countries. I’ve even seen a patient from Australia. So Lyme is always in the back of our mind. I will usually do Lyme testing on patients that have lived in Lyme-endemic areas when I’m doing the evaluation for CIRS. Even if they don’t have one of the dreaded or one of the Lyme haplotypes, I will still make sure that they don’t have that. Okay. Great. Is there any particular type of testing that you consider to be most useful in excluding Lyme disease? The most useful one that I’ve seen so far comes from a company in the United States called DNA Connexions, where they’re actually doing DNA and rDNA. I haven’t found anything close to as reliable as that. I’ve seen that as well. We have a lab called Australian Biologics over here, who do some DNA testing in urine for Borrelia as well. I think the PCR is much more reliable. I know Dr. Shoemaker has some objections with the usage of antibody test such as Western Blot testing and I think the PCR probably does take away those problems. There is also something called the Dot Blot which is one of the new testing and there’s some other unique testing, which is for the Outer Surface Protein A [NanoTrap]. That’s actually another test that’s being researched and some other docs like Dr. Andy Heyman are quite excited about that. Moving right along… Is there any correlation between CIRS in children and the development of adolescent mental health challenges, Dr. McMahon? Absolutely. I think in your previous podcast, which I saw with Dr. Mary Ackerley, which by the way was brilliant on both of your parts, absolutely, we see that. The brain is on fire. I once asked Dr. Ackerley, “What mental illnesses can be caused by inflammation?” She said, “All of them.” So if you take a small child and you create an MSH deficiency where their blood-brain barrier can no longer keep the tight junctions that you’re supposed to have, now you start getting loose junctions, you start getting toxins and inflammagens into the brain. They will create inflammation in the brain. That’s what we see on NeuroQuant. They will create inflammation in the brain and that can in some lead to mental illness. We definitely see cognitive difficulties in well over half of our children. I could go symptom by symptom between 60% and 50% will have all the problems except for disorientation, which is closer to 40%. It would be unrealistic to believe that they’re not getting some degree of mental illness. We also see mood swings in about 75% of children. Mood swing is just a mild form of mental illness, where you go from being perfectly happy and everything’s great to Gargh! in seconds over something that’s trivial. Okay. Great. Almost any mental health disorder really can be caused by CIRS is one of the take home points here. So that’s great. Just a couple of quick corrections. It was actually Nanotrap was the name of that testing on Lyme disease. I just want to also clarify, Dr. Janet Kim doesn’t see children, just so you guys know. Moving right along. If one gets an ERMI and it reveals an unacceptable score of 4.9, but when calculating the HERTSMI-2 from it and results in a score of zero, which score is considered more accurate? You can’t answer that question directly, but I would probably go with the ERMI. I would actually, I’m not an Indoor Environmental Professional, but I interpret these tests everyday. I would go and actually look at the test before I told you the answer. Here’s the reason. It’s possible that you could have an ERMI that had a very high level of one of the 26 molds, which is not one of the five that we look at with HERTSMI. It could be that that’s not a toxin former and so it’s less concerning. On the other hand, a 4.9 means that you’re about 1,000 times higher than what you want to be in the amount of mold in your house. So what the zero HERTSMI says is, “Well, you don’t have Stachybotrys and you don’t have Chaetomium and you don’t Wallemia, but you may have all these other things that are showing up in the ERMI.” That’s what I said earlier they give you different information and you really have to look at the individual situation to know what to say. That’s why you need an experienced person to be able to interpret those for you. Yeah, I think that’s an excellent answer. I think the key to understand is that the HERTSMI-2 just focuses on five species and they are the five species which are statistically been associated more with CIRS. However, as Dr. McMahon says, every one’s individual. So if you got an ERMI of 4.9 but a very low HERTSMI, it’s going to be some other mold species other than the big five. You’ve got to find out what does it mean that you got that other thing, that other particular mold species. It could indicate that there is some significant water damage still happening, but your going to need a further assessment. Exactly. If I can just say one more thing about that, I keep interrupting you. Sorry, Sandeep. We use the word mold all the time, but mold is really a euphemism. In that paper that you and I worked on together regarding IEP evaluation of a house, there are 30 different toxins, inflammagens and microbes that are identified that can trigger your innate immune system. Mold only is a part of about four or five of those. So you’ve got volatile organic compounds (VOCs) and microbial volatile organic compounds (mVOCs) and spirocyclic drimanes, and mannans and beta-glucans. I mean, the list goes on and on up to 30 of different things in a water-damaged building that can trigger you. So to just look at a HERTSMI and say, “Well, it’s okay for sure,” it’s not for everybody. Great. Thank you for that clarification. So if you have one species that’s very high, unless you can relate that there was an isolated incidence of why that is high in that particular room, you have to believe that the whole building is water-damaged as the result of that elevated ERMI with a 4.9. It’s a very common problem that I’ve seen in our patients here too, so thank you for clarifying that. I’m going to change gears here very quickly and just do a quick infomercial for Mold Illness Made Simple course if that’s okay with you, Dr. McMahon. I think your course is excellent. The bottom line here and this is actually really coming from my heart is that CIRS can be extremely confusing and not only confusing. I want to clarify. It can be extremely overwhelming. I’ve been through this myself personally and have been through the recovery process. I experienced overwhelm, I experienced confusion, I experienced anxiety about it. I had concern about how it was going to affect the rest of my life. I found that the information that was available out there was not that easy to comprehend when I had a foggy brain. I created an eight-week online course to make this simpler for other people so they didn’t have to go through the process that I did. I don’t know if you know, Dr. McMahon, but I had to Skype with Dr. Shoemaker at 1:00 a.m. in the morning every time for around about nine months or so and read documents that had 100 or 150 pages like consensus documents from the GAO and the WHO. I bet you had to do that too. I’m really making a slightly easier path for people here than having to do that. Instead of reading around about 1,000 to 2,000 pages of documents that are extremely hard to understand, I’ve created an eight-week online course, which is easy to understand. Pretty much everyone who’s done it so far have fed back that they feel more clear, number one, less overwhelmed and they feel more hope. Why is that important? Well, that’s hugely important because if you’re going to keep moving on this journey to getting well, you need to have hope. You need to have clarity and you need to not be in overwhelm because what happens is when we’re in overwhelm, we freeze and we don’t do anything. So when you’re not in overwhelm, when you’re in clarity, you move forward. One of my big passions is for people to keep moving forward who have this illness and to get well, to get to the other side of this illness and to actually move forward in their lives to an even greater expression of their own life and nothing makes me more happier than to see that. I’m sure you’ve seen that a lot of times, Dr. McMahon and it’s one of the best moments you can have. Absolutely. You mentioned hope and so many patients have seen 20, 30, 40 doctors before they finally get the right diagnosis. Most of them don’t have hope. Our data shows that this is very treatable and your course really makes a very complicated illness simple. I’m very thankful that you have created this. Thank you, Sandeep. You’re very welcome. Look, I do believe that it makes things understandable. It goes through concepts one-by-one and it breaks them down. That’s what we need. If we’re not feeling as sharp in our brain as we would like to be and as Dr. McMahon’s talked about and particularly Mary Ackerley talked about last month, this is a condition that really affects your brain and it also affects your ability to learn. Therefore, you’re probably not going to be able to understand hugely complicated information. You’re going to need simple information. If you look at the left-hand side of this slide, you’ll see how I explained the concept of cytokines. So cytokines, which include things like C4a and TGF-b1 are chemical messengers or proteins which are used by the immune system to communicate with each other. However, they also trigger inflammation for healing the body. However, when there’s an imbalance of pro-inflammatory and anti-inflammatory, which really means compounds that fuel the fire of inflammation in the body and compounds which quench the fire of inflammation in the body, then we have a problem. We have a silent fire of inflammation going on in the body, which can lead to damage. This is an example of how I explained concepts, which are otherwise very difficult I think in a much simpler way. At that end of that explanation, you should have a bit of a visual of what a cytokine is. Then what we do is we go one-by-one in explaining what each one are. At the end of this course, you will understand what C4a is and what it does. You will understand what TGF-b1 is and what it does and you will understand what MSH is. These are really, really key things to understand. Otherwise, you can’t understand what your blood tests mean. You’ve got to really have some grasp of this to have an idea of what’s really going on in your body and how you can recover. Secondly, if you look at the bottom left-hand side of this diagram, we talk about some of the different ways that a building can be fogged or gassed or sprayed. 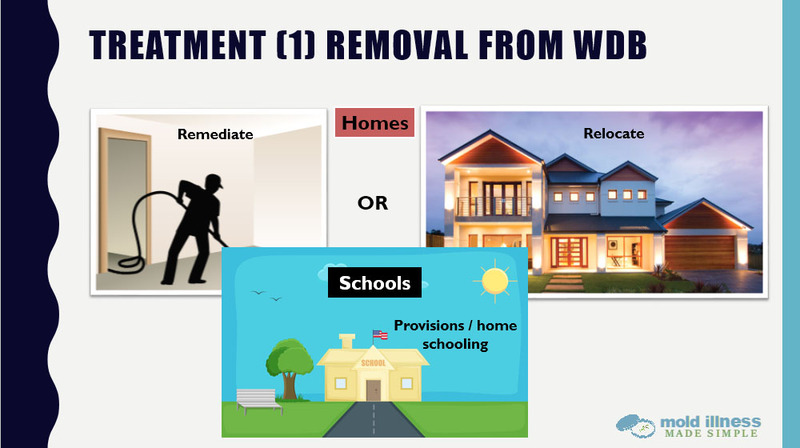 We explain that none of these should be used as the sole remediation method. They are adjuncts to mold removal only. I break down the three major types of fogging, gassing or spraying methods and we explain why the last one is the only one that we recommend and that’s the only method that’s endorsed by the Surviving Mold Panel. One thing you will get out of this course is information that is reliable and approved information by Dr. Shoemaker and his group of physicians. That’s a big advantage over just getting the information through the Facebook groups and other groups, although there are some excellent people on there like Caleb and other people who give very high quality information. Other times, there’s just other people who are new to the whole thing giving information and they may not be giving the level of quality of information that you need to get better. On the left-hand side, you’ll see the PowerPoint presentations and videos we provide in the course. On the right-hand side, you’ll see the workbook that we provide for each chapter. There’s 18 chapters to this course that are delivered over eight weeks and each of them have these video lectures and slides. Then at the end of each week, we have a weekly quiz that you need to get through to get to the next one. They’re basic and they just get you to revise the key concepts of each chapter. 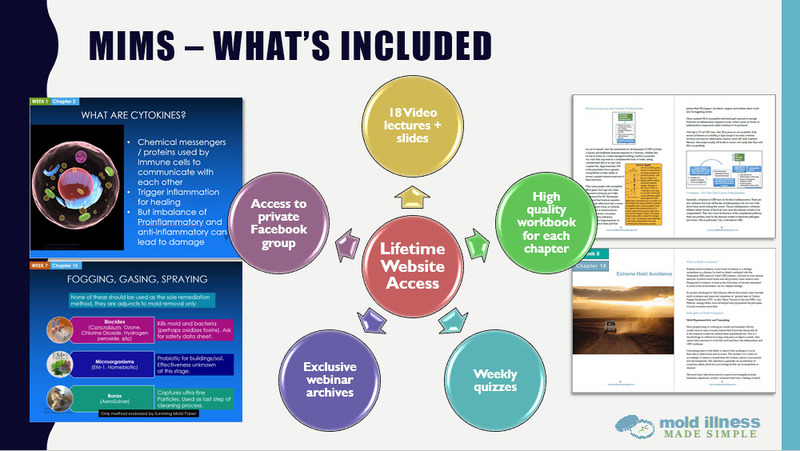 Then we also have the webinar archive so all of the previous webinars which have been given so far including Dr. Ackerley, including Dr. Samantha Clark and Dr. Sonia Rapaport, all of those webinars are available to people who subscribe. Again, we are offering this coupon for the next 48 hours. So if you go to the Mold Illness Made Simple course and type in this coupon, KIDSBEATSCIRS when you’re signing up, you will get a 25% discount. I really believe this course is worth it. I can say that from full sincerity that it’s very important to understand this illness properly and to have clarity. I’m very, very confident that you will get that from this course. So anything that you want to add before we jump back in to questions and answers, Dr. McMahon? No. I highly recommend your course. It’s excellent. Thank you very much for saying that. Okay. So infomercial done and back into questions here. So the next question we have, Scott, is can long-term untreated CIRS in mold-affected children become a neurologic and/or developmental trauma in addition to CIRS? Absolutely. I mean, they’re all connected together. Yeah, and I would add to that as well that the trauma of this illness is actually very under-recognized I think. The trauma of having to move house or to have to leave your house for a certain period of time while it’s being remediated is big. Many people have that family split or have family problems as a result of this illness. The trauma from that to children and also to the adults themselves can’t be underestimated. In some cases, children have to change schools as well I think due to this illness. So all of those will be traumas. Sure. In addition to that, some people don’t believe. If I tell you I have a mold illness and you’re my friend and you just don’t believe me, well, that friendship will probably part as time goes on. There are people that find themselves quite isolated. Families break up over this because maybe mom has the illness and dad doesn’t and he doesn’t believe that it’s real, he doesn’t want to spend the money to remediate the house or whatever. Yeah, it can be very traumatic. That’s right. Maybe if you have a child who’s slightly on the autistic spectrum or maybe already has difficulty making friends, then all of a sudden having to change school or have this illness on top of what they already had can also, it can be a little bit of a setback. The important thing is if they go through the treatment, they are going to get through it and get better. Their social skills and so on are going to start to come back. They will form a better social circle with time and they are going to have a normal productive life as they grow through childhood. So that’s some hope right there. Okay. Great. So “Dr. McMahon, your research suggests that NeuroQuant is very accurate for detecting mold-induced multi-nuclear atrophy and inflammation. Is it equally accurate for detecting Lyme?” That’s maybe a slightly confusing question, but you follow what they’re asking there. If I get a NeuroQuant that suggests Lyme, I certainly will do more invasive testing in a patient if they haven’t previously had that diagnosis. I don’t think we use it as a diagnostic criteria for Lyme disease, but it certainly will set me on that pathway if I saw one that was positive. Yeah, that’s a great answer. On the subject of NeuroQuant again; “Can NeuroQuant be used to monitor treatment success or is there a significant lag time before inflammation and atrophy reverse themselves?” Maybe you could just speak about NeuroQuant in children in general, if that’s okay, Dr. McMahon. Before I had mentioned that as MSH becomes low and also TGF-b1 and MMP-9, some of those cytokines that you recently mentioned, as they become high, they degrade what’s called the blood-brain barrier. The arteries of your body for the most part throughout your body, they leak a little bit, and they leak into your tissues, but the brain doesn’t like that. So where the arteries comes to the brain, the brain offers a couple more little cells and they make instead of loosey-goosey junctions where stuff – I’m sure my illustration is terrible here with my hands – but in the rest of the body where small proteins are able to leak into the body, they’re not able to leak into the brain. The brain likes that. Very sensitive tissue. As MSH drops, as MMP-9 increases, as TGF-b1 increases, as VEGF drops, you start taking tight junctions like this and they become a looser junctions and stuff can start squirting into the brain out of the blood vessels. Those are things like toxins and products of inflammation, cytokines into the brain and setting up inflammation in the brain. So that is a lot of what the CIRS illness is. It affects your cognitive ability, it affects your caudate nucleus, which is involved in attention and your mood, your ability to recognize languages, your motor planning and other things. It’s involved in all of those things. Half of your brain typically on a NeuroQuant will be inflamed – swollen up – half of your brain. The forebrain parenchyma, the white matter here and the cortical grey that covers over it make up half of your brain. They will be inflamed typically on a NeuroQuant. We see that in adults, we see that in kids. What we’ve also seen in adults and we haven’t done enough in kids to be able to say the same thing, but we’ve seen in adults is that as you follow the steps of Dr. Shoemaker’s protocol that the areas of your brain that are swelling up come back to normal, come back to control levels. What the most recent study shows is that as you use VIP that grey matter nuclei like the caudate nucleus start to build up again where before they were small or atrophic, they start to get bigger and stronger. It’s almost like they’re being rebuilt. So pruning that was happening before perhaps with elevated levels of C4a and what not, pruning is being reversed. The opposite or pruning is learning. So the brain is improving and coming back to normal and that’s exciting. The obvious question that comes up from me is that if you’re saying in children the majority ofof children will only need the first two steps. So to be removed from exposure and to use binders, does that mean that maybe in their cases caudate atrophy may reverse without use of VIP or that would VIP still be needed even if they’re feeling better, if we wanted to reverse caudate atrophy because obviously, parents are not wanting their children to have an abnormal brain as they’re growing up? Yeah. Time will tell. We haven’t done enough NeuroQuants yet to know that. Time will tell. It’s a good question. We still look at the whole protocol that we do with Shoemaker. We just don’t always do every step in children because we compare the risks versus the benefits of treating a particular step and VIP is the most experimental. [1:29:25] How long do you use VIP? On that point of VIP; “For around how long do you generally need to keep children on VIP” or is that another unanswered question at this point? At this point, it’s an unanswered question. Generally speaking we haven’t taken any children off of VIP because they’re doing so well. The ones who have stopped it because of resources or travel or whatever, we have seen almost immediate declines when they came off. You have to keep in mind that VIP is a chemical that your body makes. Your brain makes VIP in the hypothalamus and it does a number of things. It helps run your 24-hour clock, your circadian rhythm. It helps the neurons fire properly so that your brain functions properly. It helps the secondary messenger cyclic AMP in almost every cell of your body. Well, actually, every cell of your body uses that and it’s a major inhibitor of the immune system. That’s the problem in CIRS is that your immune system has gone wild. The silent fire that you’ve talked about is raging inside and VIP is a major inhibitor of that and almost everybody is low in the amount that they’re making in their body. So VIP supplementation for many people will be for life. Well, that’s actually quite surprising. I didn’t actually realize that so thank you for clarifying that. Generally over here, I’ve been using it in adults for six to 12 months generally and using NeuroQuant studies as a way to determine how long I would use it in patients. So one of the topical questions which has been coming up on the forum is about MSH and being able to raise lowered MSH. Generally, you finding that VIP nasal spray is raising people’s MSH, are there any other ways that you know to increase MSH other than VIP nasal spray? As far as raising MSH, in the United States we don’t have a lot of choices. MSH used to be available here and the FDA banned it a number of years ago. There are a number of research protocols going on, but we can’t legally prescribe it here. That being said, there are people who obtain it from labs. There are people who order it from Canada. In Australia and probably throughout the United Kingdom, there are alternatives like Melanotan II than can be purchased. …We do see VIP come up in some people and we don’t see it come up in others. We don’t really know the reason for that at this point. It may be that the part of the hypothalamus that makes it has got burned out. It may be that the portal system; it may be that you’re making it, but you can’t get it out of. I think that was Dr. Shoemaker’s thought is that you can’t get it out of there – you can’t get it to travel to where it needs to go. Don’t know really why some people get better and some people don’t. Okay. Great. Okay. That’s a good answer. Thank you. Now, changing gears here a little. We know in pediatrics some of the common problems that we encounter are children with growth issues and developmental delay. Can you talk about whether CIRS can be a contributing factor to growth issues and to develop mental delay? I’ll take those one at a time. The first one, growth factor. I have seen it. It’s usually only in more severe cases, but it’s fascinating because the pituitary makes nine different hormones. We only test six of them and we see abnormalities in the systems involved in all six of those. Growth hormone is one of those nine that we don’t test. It’s one of the three of those nine that we don’t test. I wouldn’t be surprised at all if we saw abnormalities in growth hormones. Problem is clinically, we just don’t know what to do with that. So that’s why I don’t particularly study it and we don’t have really great testing for growth hormone. I have seen growth delays and I’ve seen them recover with proper therapy. As far as cognitive things, I have one patient. She was four years old. When hurricane Sandy hit, the apartment her family was living in got water-damaged. Six months later, she was diagnosed with autism. Had been perfectly normal, maybe mild speech delay before that, and now all of a sudden, she’s autistic. I found them or the mom found me. We talked about it, we treated her. In two months, she saw the neuropsychologist again and said, “This isn’t autism.” I mean, it was completely reversed what they have called autism. Now, she goes to regular school and has no problems. We clearly can see developmental delays and we can see them reversed. I’ve been involved in several cases of children who had developmental delays after being exposed to water-damaged buildings that had gone to litigation. We were able to show that these kids had complete reversal with therapy. When you look at the literature, you see that these kids are not alone. Right. Okay. Great. If a child was showing some other kind of developmental delay not specifically cognitive, but maybe in some other areas, social or learning or sorry, learning is probably part of cognitive, but some other forms of developmental delay, is that something that you would still consider looking at CIRS as a contributory factor? Okay. Great. Okay. 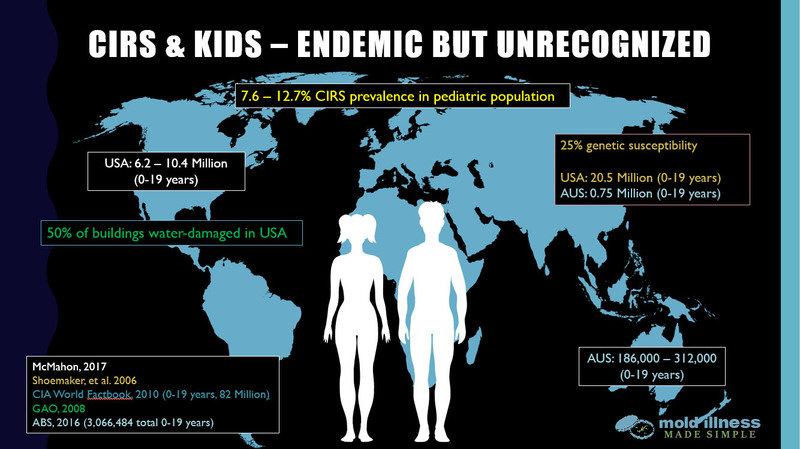 I guess in summary, CIRS, from today, one of the big things I’ve got out of this, Dr. McMahon is it’s such a huge problem in children and it can cause such an array of different issues. I’ve certainly learnt a lot from this webinar. I hope everyone listening has as well. I know that’s been very enriching and it’s giving you some more confidence around knowing how you can get your children further assessed and/or diagnosed for CIRS. I’d like to give a big thank you to Dr. Scott McMahon for joining us today. It’s been very, very informative and I’m really, really appreciative of you sparing your time for this call. I also want to just acknowledge you for you contributions to this field of CIRS through these studies that you’re publishing and I think that’s making a big difference to the advancement of this field. So thank you for all the late nights that you’re putting in here to advance in this field. Thank you and then also I want to say thank you to Caleb Rudd for the technical support and the content support. I mean, there’s no way we would have been able to have done this without him. So have a great rest of your day, everyone, whether you’re in the US or Australia or elsewhere. We hope that you have a healthy and happy rest of the year. So thank you and bye for now.